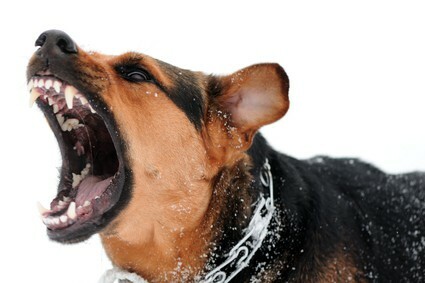 Aggressive dog behavior is a cause for concern for any dog owner. Not only can it result in injury to people or other dogs, but it can put their master at risk of an expensive lawsuit. Home owners often don't mind aggressive behavior in their dog. After all, he is protecting his home and family, and that's not a bad thing. However, there's no need to rely on this to keep your loved ones safe, because even the sight of a dog is often enough to send intruders on their way. Biting is the most extreme aggressive behavior in dogs, but growling, snapping and lunging are also indicators that your dog has a temperament problem. There are many reasons why a dog shows aggression, and each one needs to be managed differently. Breed – Some breeds are instinctively more aggressive than others, because they have been bred to fight. The American Pit Bull Terrier and the American Staffordshire Terrier are examples of such breeds. The Shiba Inu isn't known for being aggressive, however there is a genetic sequence in some individuals that has been identified as being involved in increased dog aggression to strangers. Gender – Male dogs are more likely to bite than female dogs, and intact dogs are involved in more acts of aggression than neutered dogs. Also, mother dogs with a litter of pups are very protective of their babies, and will snap at any perceived threat. Fear – If a dog feels threatened or afraid, they can show aggression to defend themselves against any person or dog that approaches them. Pain – Dogs that are hurting will growl at anyone who approaches them, because they don't want to be hurt any more. Resource guarding – Food aggression in dogs is an example of resource guarding. Another is when a dog won't let anyone touch a favorite toy. This isn't an acceptable behavior at all, and it often leads to children being bitten as they pick up a toy for a game. Any signs of aggression in a dog should be dealt with straight away, to prevent him learning that growling and biting is acceptable. However, don't try and tackle this yourself. Any aggressive dog training should be supervised by a skilled professional. Otherwise you may get bitten, or your dog's behavior may get worse. Breed related aggression in dogs isn't easy to manage, because that behavior is hard wired into them. Neutering can reduce any bad behavior related to gender, and if your dog is hurting, then veterinary care is needed. Dogs with fear aggression need careful and gentle handling, to build their confidence and to teach them that people and other dogs aren't a threat to them. Sometimes medication can help to reduce their anxiety while they learn new ways of interacting with others. Food aggression in dogs, and any other resource guarding behavior, is managed in a similar way. Dogs are given an extremely high value reward for allowing their food bowls to be touched, and their toys to be picked up. This aggressive dog training technique is dangerous, so seek professional help before you try it out. The most important part of preventing unwanted behaviors in dogs is to raise them properly from puppy hood. Teach them that it is okay for someone to pick up their food bowl or to take their favorite squeaky toy. Make this a positive experience with treats and cuddles when they behave nicely. When it comes to fear aggression, socialization is the best insurance against this. Take your pup to pre-school and dog obedience classes, and allow him to mix with other people and dogs in a safe and friendly environment. If he learns to relax in different situations and environments, then he will grow into a calm and adaptable adult. Owning an aggressive dog can make life difficult. You need to be constantly alert and aware of what your dog is up to, and it can take away some of the pleasure of sharing your life with a dog. With the correct upbringing and appropriate training as an adult, aggressive dog behavior can be a thing of the past.